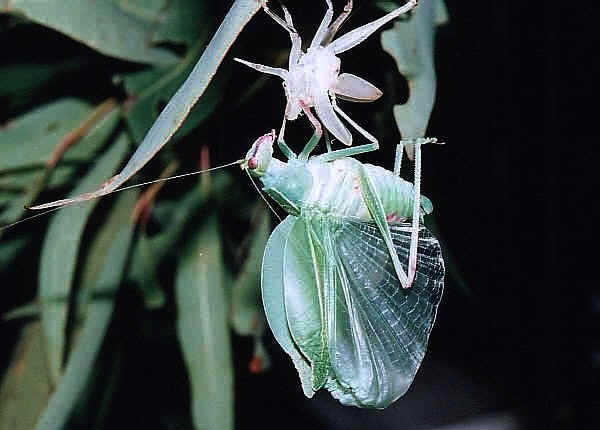 Katydid's last moulting - turning from nymph to adult. Gradual metamorphosis, also known as in-complete metamorphosis. Cockroaches, grasshoppers and bugs develop with in-complete life cycle. Their young, usually called nymphs, look similar to the adults but with no wings. They share the same habitat, the same food and same lifestyle. Their wings develop externally. So we can see their wing buds and it increase in size after every moults. Details of in-complete metamorphosis of this bug are shown in this page. Abrupt metamorphosis, also known as complete metamorphosis. Beetles, flies. butterflies, moths and wasps develop with complete life cycle. Their young look very different from the adults. When they just come out form eggs, they may called maggot, caterpillars, grubs or commonly called larva. Their life style is very different from their adults. Just before they become an adult, they will enter a stationary state. Then their body is completely transformed into a different shape. Their wings develop internally. Their different stages target at different function. The larva stage is mainly focus on eating and growing. The pupa stage is for transformation and the adult aims at reproduction. For details of insects complete life cycle please visit this page. So that adults and larvae can divide their tasks more preciously. Larvae have their body shape aim better at feeding and avoid predator. Adults have better body shape to find mate and reproduce. We noticed that some insects become more utilize their wings. Most Abrupt metamorphosis insects help their young in locating their food source. Some Abrupt metamorphosis insect larvae loss most of their locomotive capacity, only can move in a very limited area for feeding. It is because the wings of their adults are much more efficient to locate the food. Wings are the very powerful tool of insects. Wings are the very expensive tools too. Some insects extends it function to locate the food for their off-springs. We have more discussions on this in the Conflicts Between Insects Adults and Larvae page.